1100 aluminum sheet is the most commercially pure alloy of all the aluminum grades. It includes a 99% or greater content of aluminum compared to other aluminum alloys. The most common way to form 1100 aluminum sheet is cold working. However pure aluminum can be hot worked as well, but more frequently, aluminum is shaped by spinning, stamping and drawing, and none of them require the use of high heat. 1100 aluminum sheet can reach international standards, so the quality can be guaranteed. And our products have been sold in many countries all over the world. Over 99% content of aluminum, 1100 aluminum sheet is soft and has low strength, so it is not suitable for high-strength, high-pressure or hardness applications, instead, it is used for chemical equipment, decorative trim and heat exchangers. 1100 aluminum sheet has superior correction resistance, formability, conductivity and high weld-ability, so it is best used for welding, brazing and soldering but has poor machine-ability. 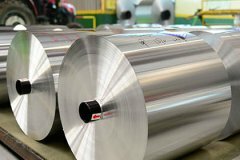 For the features above, 1100 aluminum sheet and 1100 aluminum coil are both available for various applications, including chemical storage and processing equipment. 1100 aluminum sheet is nonmagnetic and non-heat treatable, besides, it has great finishing capacity, so it can be a wise choice for decorative applications.